Kate Beckett has been near the top of my list of strong female characters on TV since I started watching Castle. She's a lead homicide detective for the NYPD. She is well known in the force for her talent and well known in general as the muse for Richard Castle, the bestselling mystery writer who bases his character Nikki Heat on her. She is intelligent, she can throw around suspects twice her size, she can banter with a womanizing bestselling author, and she looks amazing all the time. On top of that, she's a fully developed character. Yet I've been struggling to write this post, and I've finally realized why. It's not because I have any problems with Beckett, it's that I think it's almost too obvious why she's an incredibly strong woman. What I could I really say that wasn't just plot summary? As I considered Beckett more, I began thinking about the realism of the Kate Beckett character. While her personality and career trajectory are certainly realistic, there's still a lot of TV magic involved. Stiletto heels are not an NYPD detective's most likely choice for footwear when chasing fleeing suspects. Beckett's hair has to take at least a half hour to blow dry each morning, if not longer, and her make-up is well done for someone who stays up late solving crimes. On top of that, her apartment is gorgeous for someone on a city employee's salary. by trying to figure out how she gets her hair to curl like that. I feel like the interrogation wouldn't end well. As I thought through these details, I realized I am perfectly okay with them. 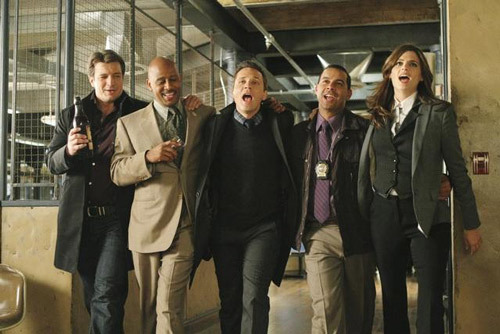 Beckett is in many respects a woman's fantasy in the same way that Batman, Barney Stinson or Castle is a man's fantasy. It's not likely that someone could be as rich, intelligent, and badass as Bruce Wayne while fighting crime with a secret identity, but what guy (or girl) wouldn't want to imagine doing that? Beckett even has the traumatic back story that drives her work, just like any good superhero. She constantly strives to solve her mother's murder, and her experience pushes her to solve crimes and give other victims' families the peace that she doesn't have. Since my biggest threat at work is that I'll develop carpal tunnel syndrome and I still can't manage to get up early enough in the morning to dry my hair much less get it look like Kate Beckett's, watching Castle lets me live vicariously through her character. She absolutely has problems and complications, but I get the same kind of enjoyment from watching her question a suspect that I do when I watch Batman fire up the Batmobile. or at least the actors that play them on TV. Her femininity factors into the reasons I enjoy the show so much. Rather than dressing in boxy suits or conservative outfits to blend into a traditionally masculine environment, Beckett remains professional without hiding her looks. She doesn't necessarily flaunt them, either (aside from the TV magic part. I mean, she is on prime time), which puts her a step ahead of Wonder Woman in my opinion. She also doesn't try to act tough or masculine to fit in. She is who she is, and her coworkers respect her for her talent and intelligence. While she uses her sexuality at times to tease Castle, it's not a defining part of how she acts. There are few female characters that I can think of whose strength is physical as well as emotional, moral, intellectual or otherwise intangible. Kate Beckett manages to have all of these strengths and look good without wearing a skimpy costume. If that's not enough to make her a someone a girl could dream about being, I don't know what is. 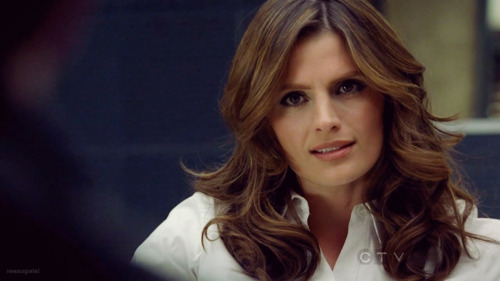 What do you think of Kate Beckett? What other female police officers/FBI agents/crime fighter characters do you like or dislike? my favorite female police officers/FBI agents/etc. are the ones on Rookie Blue and also Criminal Minds. Criminal Minds is consistently an excellent show as it is, and I like the dynamics of the characters on Rookie Blue, which I think will be back for a new season sometime soon. CSI and CSI: Miami are up there too (not a big fan of the NYC version).